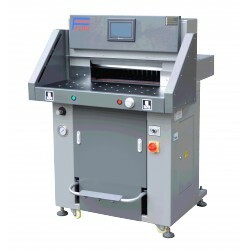 Hydraulic paper cutter There are 4 products. 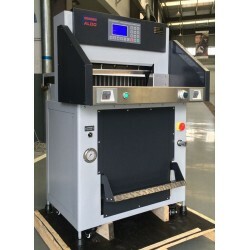 The FO-528HPM is a program controlled paper guillotine with a cutting width of 52cm/20,5 inches most suitable for cutting A-3 and with a cutting height of 3,15cm. Unique design with a slottless back paper table. PLC controlled paper cutter, resulting in a most stable machine. Full color touch screen. The machine works on 220 volt. The FO-678HPM is a program controlled paper guillotine with a cutting width of 67cm/26,5 inches with a cutting height of 3,15cm. Unique design with a slottless back paper table. PLC controlled paper cutter, resulting in a most stable machine. Full color touch screen, infrared safety device. The machine works on 220 volt. 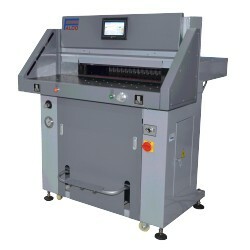 The FO-678HPM is a program controlled paper guillotine with a cutting width of 72cm with a cutting height of 8cm. Unique design with a slottless back paper table. PLC controlled paper cutter, resulting in a most stable machine. Full color touch screen, infrared safety device. The machine works on 220 volt. 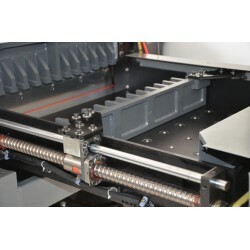 Heavy duty hydraulic program controlled paper cutter with hydraulic clamping and hydraulic cutting, Swing cut blade control, Double guided clamp for accurate and even clamping left and right. Double screw back gauge with a slottles stainless steel paper table. Very heavy and solid structure.